If fishing from a boat, fish in the channel in the deepest part of the stream. Another good place to fish is just below riffles. While bank fishing, look for a fishing spot where the water is deep in the channel with overhangs. Although trout sometimes take the bait off the stream bottom, it is preferable to float the bait just off the bottom about the length of the leader. This can be accomplished by placing a miniature marshmallow on the end of the hook after the bait or by inflating a night crawler with a hypodermic needle. Commercial dough baits also float. While holding the pole in your hand, wait for the telltale “tap-tap-tap” of the rod tip that signals a trout has taken the bait. Common trout baits include corn, night crawlers, redworms, wax worms, crayfish tails, sculpins, minnows, salmon eggs and commercially produced molded dough-type baits. When bait fishing, fish near cover, such as tree roots, rocks or overhangs. Ultralight spinning outfits spooled with 2- to 6-pound-test line can be used to throw small jigs, spoons, spinners and crankbaits. Heavier bait-casting outfits rigged with 12-pound-test or heavier line can be used to throw larger crankbaits and stick baits when targeting big brown trout. Cast a marabou jig with a bobber fixed above it upstream and allow the current to drift the jig past likely areas. The bobber will indicate a strike and keep the jig off the bottom. When fishing with artificial lures, fish near cover, such as tree roots, rocks or overhangs. Slide a slip sinker on the line, attach a barrel swivel, tie on 2 to 3 feet of 2-pound-test leader and finish off with a bait hook. The marshmallow provides flotation for the hook. Illustration by the AGFC. A 3- to 6-weight rod spooled with a weight- forward, floating line works well to catch trout on Arkansas tailwaters. Nine-foot tapered leaders in 3X to 6X are usually adequate, depending on water current and clarity. Tipping the leader with a few feet of appropriately sized tippet will save wear and tear on your leader. When conditions get tough (low, clear water and heavy fishing pressure), fluorocarbon tippets are helpful. Common flies used are sowbugs, scuds, nymphs and soft hackles in sizes 12 to 20, drifted under a strike indicator. In shoals, let the soft hackles swing with the current at the end of the drift. Streamer flies such as woolly buggers, fifty- sixers, clousers and sculpins are effective when cast across current, allowed to sink and then stripped back with an erratic retrieve. Though not as common here as in the West, dry fly anglers will find opportunities to fish various mayfly imitations, terrestrials, attractors and midges at certain times of the year. When hydroelectric power is generated, a surge of water released from the dam makes it unsafe to anchor a boat or to wade. When this happens, most anglers turn to drift fishing. Although the bait rigging for drift fishing is similar, the baits commonly used are night crawlers, redworms or a glow worm/salmon egg combination. A rig commonly used in the Bull Shoals tailwater is created by tying a knot in the line to create a “Y” in the line. One leg of the Y is a 10- to 18-inch dropper with a bell sinker. The other leg is a 24- to 36-inch leader that holds the hook (see illustration). A standard technique for drift fishing is to turn crosswise in the river and float downstream while drifting bait over the top of moss beds. To target brown trout while drift fishing, drift on higher water while throwing crankbaits or jerkbaits against the bank and using a jerking retrieve. 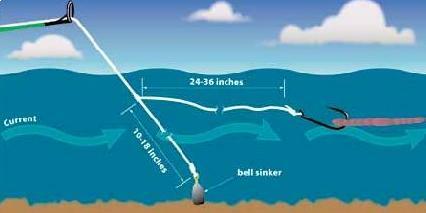 When drift fishing with fly-fishing gear, use a strike indicator and a sinker or use special sinking lines. This rig, often used for drift fishing on the White River, can be baited with many kinds of trout bait including night crawlers, redworms or a glow worm/salmon egg combination. Use 4- or 6-pound line, clear or light green, to be less visible to fish. Illustration by the AGFC.